The printing feature of Digital Photos For Dummies works like a wizard. The first screen lets you choose the type of printing and setup your printer options: paper format (that is to say the type of paper you are going to use), print quality and orientation. 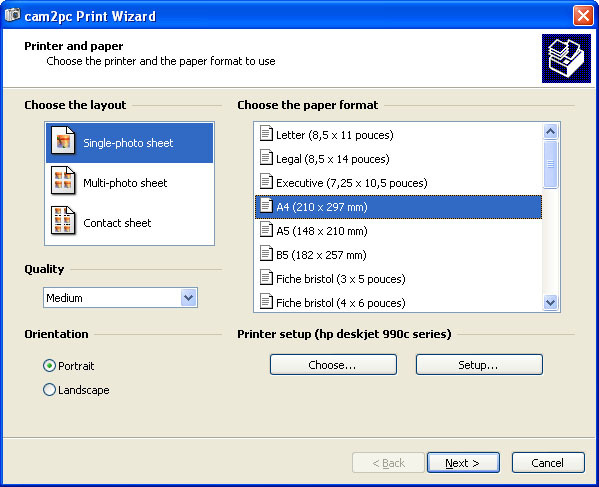 If you have several printers installed on your computer you can select the right printer to use by clicking on the Choose button. This printing is used to print one picture on a page. Generally you will fill the page with the picture but some preconfigured formats are available to you if you want to make sure that your picture is of a certain size: for instance you may want to use it as a CD Label. Of course, if you choose one of these formats then the paper size selected in the first screen must be able to hold that size! The options let you customize how your pictures will be printed in the template. The fitting option lets you select how your pictures will be resized to fit the space provided. No scaling means that the picture will be printed in its exact resolution. Most of the case the image will have to be cropped to fit the space. Scale to fit may let white strips appear on the sides of the image if its aspect ratio does not match the aspect ratio of the space. The last option (Scale and crop) ensures that the whole space will be filled by the picture, but some part of the picture might be cropped to satisfy the aspect ratios requirements. Use this option when using a paper template bought in a store. Supported brands include Avery, Kodak and RankXerox for instance. First select the brand of your paper in the first combo. The list of type papers supported for this particular brand will be used to fill the Type list. Browse the type list until you find the good paper. Use the thumbnails to ease the search. Pay attention to the fact that the paper type you choose here must match the paper format you chose in the first screen of this wizard. If you selected Letter format on the first screen then you won't be able to use a A4 paper made by Avery for instance. 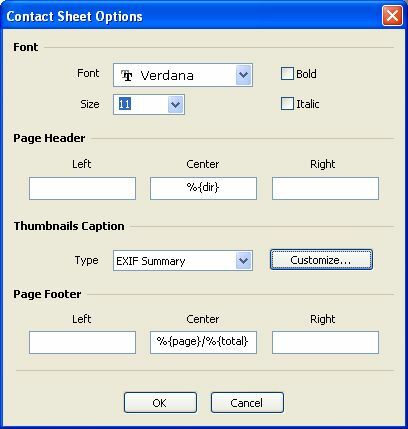 If you do not find your paper you can choose the custom type and set the number of rows and columns manually. The fitting options work the same way as they work in the Single-photo sheet printing type. Contact sheets are ideal to keep track of your pictures stored on disk. Contact sheets allow you to print additional information under each picture like the filename or the comment you added to your pictures. Choose the number of rows and columns of your contact sheets and you are done!